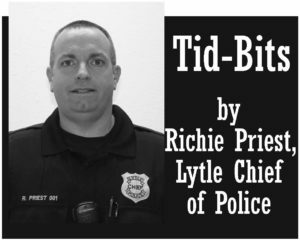 Here is the weekly report on Lytle PD activity…….We had 61 calls for service and conducted 56 traffic stops. Citations led the way with 30 while warnings lagged behind with only 26. We had three property crimes, all were fairly minor. We had a beer run at H.E.B. Plus, the suspect ran out with a couple cases of Budweiser. Then we had an anti-freeze run from AutoZone (first one of those I’ve seen). The final theft was three wooden pallets from behind the CVS Pharmacy. Even with my imagination I can’t come up with a story to tie a “beer run,” “antifreeze run,” and a “pallet run” together. We had two arrests, both were warrant services. Capt. Reyes nabbed a guy wanted on a weapons charge and Lt. Dear got a female wanted by the U.S. Marshals for alien smuggling. I had the pleasure of meeting Webb Co. Sheriff Martin Cuellar at the Border Security Conf. in San Antonio last week. He is the brother of U.S. Representative Henry Cuellar. He seems like a great guy, if I ever get arrested down in Laredo I bet he would get me a cell with a good view.